There are different underlying reasons for developing both disorders, which we will explore in greater detail later in this article. But first, let’s get a better understanding of the various forms an eating disorder can take. Having an extremely low body weight. Refusing to eat in front of others. Bone thinning or weakening (osteoporosis or osteopenia). Multiorgan failure (liver, kidneys, etc.). Other gastrointestinal issues caused by misusing laxatives or diuretics. Chronically inflamed or sore throat. Worn tooth enamel, sensitive teeth, or decaying teeth due to repeated exposure to stomach acid. Severe dehydration from purging fluids. Electrolyte imbalance (which may lead to heart attack or stroke). With this better understanding of eating disorders, let’s examine what may drive co-occurring substance abuse in many of the people who suffer from them. As eating disorders become more severe, so does the increase of substance use. Attempts to lose weight by purging are associated with the use of stimulants, such as amphetamines; sleeping pill abuse is also common. Severe binge eating disorder is consistently associated with alcohol abuse. People may use food, drugs, and alcohol to help them cope or numb out negative feelings. A person recovering from an eating disorder may use a substance to cope with the discomfort associated with recovery. 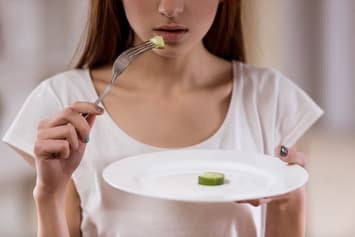 A person recovering from substance abuse may develop patterns of disordered eating to compensate for the missing drug or alcohol. While there isn’t any single predictive factor to determine whether you will develop co-occurring substance abuse and eating disorder issues, the more risk factors you have, the most susceptible you are. However, comprehensive, timely treatment can help you manage both conditions. It is possible to recover from eating and substance abuse disorders with various treatment methods. The sooner you find help, the better, since the negative consequences associated when these diseases when left untreated can be deadly. Eating disorder treatment must begin with medical stabilization. Depending on the severity of your disorder, hospitalization may be required due to extreme malnutrition and low body weight. Heart arrhythmias are among the most serious of issues that must be resolved before moving onto the next stage of treatment. Medical care and monitoring: This may begin with thorough physical and psychiatric examinations to address (or rule out) any potential medical or additional mental health issues. Ongoing care may involve FDA-approved medications, such as antidepressants. Individual and group therapy: Mental health professionals help you explore the root causes of your eating disorder; teach you to challenge negative thought and behavior patterns; and develop healthy coping mechanisms for common triggers. Family therapy: You will work through interpersonal issues related to the eating disorder with your family and help your family members understand the eating disorder and how they can better support your recovery. Nutritional assessment, management, and counseling: A nutritionist or dietician helps you relearn how to relate to food in a healthy way, and supports you through meal prep, meals, and restaurant outings. 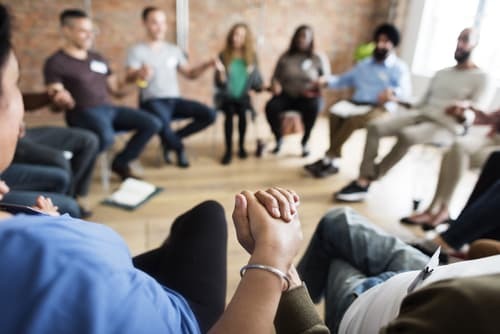 Mutual support groups: You may join and regularly attend support groups—such as Food Addicts in Recovery Anonymous (FA), Overeaters Anonymous (OA), or other programs—that offer peer support and a safe place to share frustrations, celebrate successes, and find community referrals and resources. Inpatient and outpatient detoxification and rehabilitation: Treatment may include detox, counseling, mutual support groups, and alternative therapies (e.g., equine therapy, yoga, or Reiki). Medication: FDA-approved medications can help ease the withdrawal symptoms associated with various substances. Psychotherapy: Mental health professionals apply various therapeutic modalities to help you uncover the root cause of your addiction; strengthen your motivation and confidence to recover; help you build a healthy support system; repair damaged or unhealthy relationships; set reachable goals; and help you develop skills to help you cope with triggers or avoid them altogether. Mutual support groups: Groups such as Alcoholics Anonymous (AA) and other 12-step or non-12-step programs provide peer support for those trying to stay abstinent from drugs and alcohol. Many treatment facilities combine eating disorder and substance abuse treatment into one holistic program that supports you through your early recovery from both disorders. Locating advocacy groups, government, educational, and non-profits that focus on eating disorders and substance abuse can provide you the information and support you need to begin your recovery journey. National Association of Anorexia Nervosa & Related Disorders (ANAD): This organization provides information and resources about anorexia nervosa and other related disorders. National Alliance on Mental Illness (NAMI): The nation’s largest grassroots mental health organization, dedicated to providing support to those affected by mental illness. Binge Eating Disorder Association (BEDA): This national organization focuses on providing recognition, prevention, and treatment for binge eating disorder. The National Association for Males with Eating Disorders, Inc. (N.A.M.E.D. ): This group provides peer support, information, and resources for men with eating disorders. Double Trouble in Recovery: A 12-step peer support program for those managing both substance abuse and a mental illness (dual diagnosis). Food Addicts (FA): A collection of international food addiction or eating disorder mutual support groups. Substance Abuse and Mental Health Services Administration (SAMHSA): A U.S. Department of Health and Human Services agency attempting to reduce the impact of substance abuse and mental illness via education, resources, programs, and campaigns. Moderation Management: A peer support program for those considering moderating or completely abstaining from their substance use. Alcoholics Anonymous (AA): The original 12-step peer support program for those recovering from alcohol addiction. National Institute of Drug Abuse (NIDA): The leading organization in research on the causes and consequences of substance use and addiction. Narcotics Anonymous: A 12-step peer support program for those recovering from a drug addiction. Secular Organizations for Sobriety: A peer support program for those maintaining sobriety and abstinence without the emphasis on spirituality or a higher power. Smart Recovery: A sobriety peer support group for those with addictions (not faith-based). Women for Sobriety: A drug and alcohol addiction peer support group for women. There is no one-size-fits-all treatment solution to manage all instances of co-occurring disorders. It is important to first visit your primary physician or mental health professional for an assessment if you think you might have an eating and a substance abuse disorder. They will discuss your best treatment options and make any necessary referrals based on your health. Getting clean and restoring your health are simply the first aspects of recovery. It’s important to remain persistent, hopeful, and engaged in the treatments that work best for you, because a lifetime of recovery is within reach. National Alliance of Mental Alliance. (2017). Dual Diagnosis. Substance Abuse and Mental Health Services Administrators. (2011). Clients with Substance Use and Eating Disorders. National Institute of Mental Health. (2014). Eating Disorders: About More Than Food. American Psychological Association. (2011). Eating Disorders. National Center for Biotechnology Information. (2004). The Genetics of Eating Disorders. National Center for Biotechnology Information. (2009). Genes and Addictions. National Institute of Drug Abuse. (2014). Drugs, Brains and Behavior: The Science of Addiction. The National Institute on Alcohol Abuse and Alcoholism. (2014). Treatment for Alcohol Problems: Finding and Getting Help.